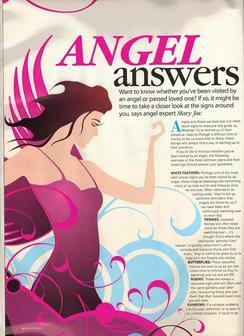 by an Angel or a passed loved one? If so it might be time to take a closer look at the signs around you. 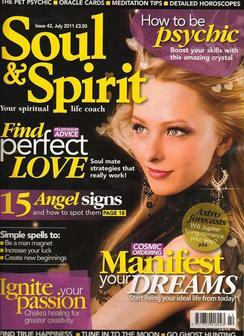 which was featured in 'Soul & Spirit' magazine in the summer of 2011. 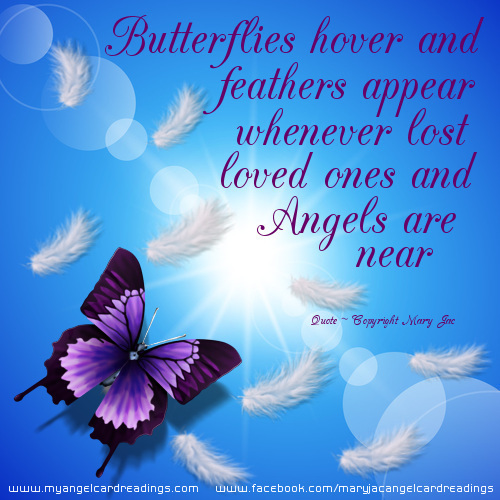 Angels and those we have lost, particularly ones we have loved dearly, will often leave signs to reassure, comfort and guide those they've visited. Whether it's to reassure us they are by our sides, help us through a difficult time or merely to let us know they're there if we need them, these beings will always find a way of alerting us to their presence – often in very unusual and unexpected ways. and their meanings should answer some of your questions. Perhaps one of the most well-known signs you've been visited by an Angel, these magical blessings are something many of us keep an eye out for and treasure once we discover. Often referred to as 'calling cards,' they're left as welcome reminders that Angels are there for us if we need them and continually watching over us each day. Celestial beings will often leave coins for those they are watching over – in fact, it's thought that's where the expression 'pennies from heaven' originally came from! Left to console and reassure those who find them – generally when they're feeling a little blue or under the weather – they're said to be tossed by angels to make smiles out of frowns. The beautiful insects are frequently sent to us by our lost loved ones, either to remind us they're always watching over us and nearby, or just to let us know they're OK. If you're thinking about Angels and a rainbow suddenly catches your attention, it's likely to be one of these celestial beings confirming their presence to you – even more spectacular when there's been no rain! Sometimes those we've lost will remind us of their presence by surrounding us with a particular fragrance or smell that makes us think of them, so take note of any familiar aromas that waft your way – you never know, they might just be a sign from a deceased loved one! Angels also like to make their appearances known through the power of smell and will often leave floral trails in the areas they have visited. Angels and deceased loved ones will also often come to us in while we sleep as this tends to be the time we're most relaxed and receptive. Generally speaking, these will be more vivid than your regular ones and remain in your mind much fresher. 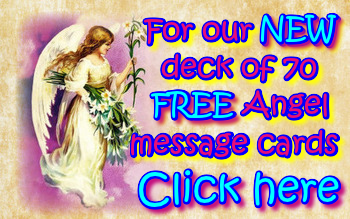 Depending on their colour, these messages will usually be sent by the angel whose help you need most at the time – if you've been going through a hard time, for instance, and keep seeing green sparkles every where you go, it could be a sign from Archangel Raphael – the Angel synonymous with healing – letting you know he's there to help you. Seemingly coming out of nowhere, this is one of the most obvious signs an Angel's come to visit you and will either literally tell you it's there for you out loud, or reassure you – perhaps when you are feeling frightened or uncertain – through a little whisper that everything is going to be OK. Hearing a song or lyric on the radio using words that help, reassure or confirm something for you is never a coincidence, but the work of angels attempting to clarify or ease a situation for you. Similarly, if you happen to be flicking through channels and come across a show or documentary that relates to something that's been troubling you at the time, don't ignore it; it could be a message from the celestial realm giving you your answer! The next time a meaningful piece of writing grabs your attention, whether it's a book suddenly falling from a shelf as you walk by, or words in a magazine that instantly catch your eye, take a moment to read what they say; you'll be amazed at how often they'll relate in some way to your current situation. 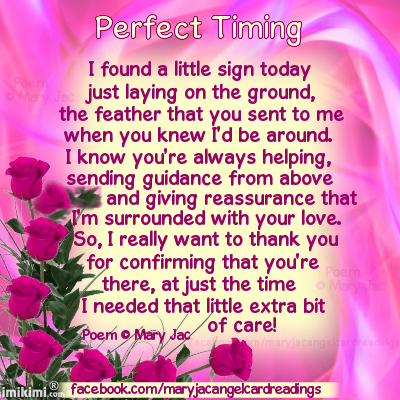 Every time they do, you can be sure it's a message from an Angel. 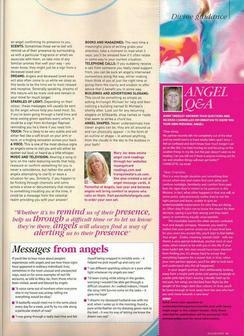 If you suddenly receive a call from someone you really need support from at the exact moment you most need them, you can be sure an Angel's intervened somewhere along the way, either making them think of you at just the right time or giving them the clarity and wisdom to offer you the advice you need. This could be something simple as asking Archangel Michael for help and then noticing a building named St Michael's shortly after – a sure sign he has heard your call and is there if you need him. 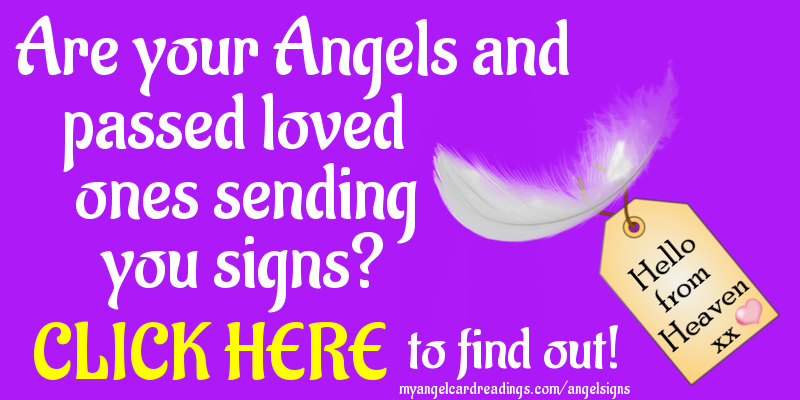 However, angels will also send their messages to you in a number of different ways so make sure you look out for any recurring slogans on billboards, shop names or roads that seem to strike a chord with you. the feather that you sent to me when you knew I’d be around. and giving reassurance that I’m surrounded with your love. at just the time I needed that little extra bit of care! for someone I care for, someone I love. tell them I know that they're still always there. because I love them right now, and will do forever! 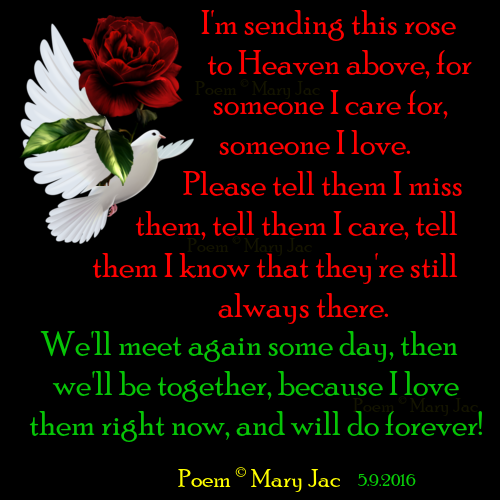 were written by and are © Mary Jac, as are many other quotes and poems on this website. you must not cut, crop, or alter the images in any way, nor should you remove Mary Jac's name or website details. any other printed material, or on any items to sell, or otherwise make a financial profit on. Doing so would be breach of copyright, please respect Mary Jac's intellectual property, thank you.